Happy Easter! 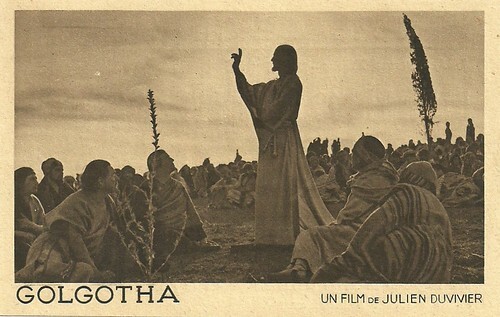 Today, a post on the French film Golgotha/Ecce Homo (Julien Duvivier, 1935), an ambitious and expensive retelling of the Last Days of Jesus Christ. In Golgotha Robert Le Vigan plays the Son of God. His performance marks the first direct portrayal of Christ in a sound film. The film covers Palm Sunday, the Passion, and the Resurrection. All of Jesus' dialogue is taken directly from the Scriptures, with no film-style adornments. Hal Erickson notes at AllMovie that Le Vigan delivers these lines with sincerity and quiet grace. Hal Erickson: "Considering the anti-Semitism prevalent in Europe during the 1930s, the question of the Jews' responsibility for Jesus' death is handled with restraint; blame is squarely laid on the shoulders of a handful of conspirators, rather than an entire race. For the most part, Jesus is shown from a respectful distance as was also the case in Ben-Hur, Quo Vadis, or The Robe, but there are also a few closer shots and even close-ups. Kevin C. Neece at Jesus Films 101: "Le Vigan holds his own in the role, presenting a more stoic Christ, unmoved by the circumstances around him. But, in a film of passionate performances and engaging cinematography, Le Vigan’s performance almost gets lost in the shuffle." 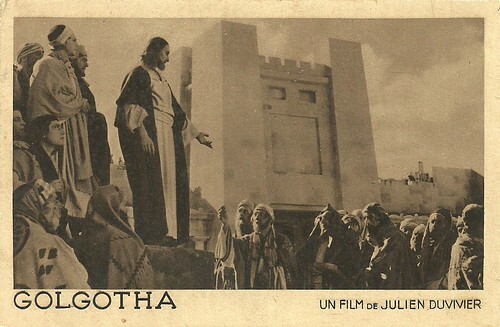 Golgotha also stars Harry Baur as Herod, Jean Gabin as Pontius Pilate and Edwige Feuillère as Claudia Procula. The cast list in the opening credits is read out by an off-screen voice. 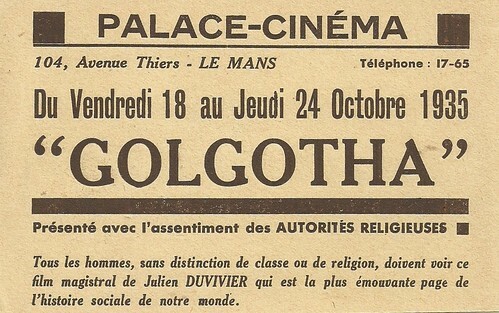 Golgotha was directed by Julien Duvivier, who had made several religious films during the silent era. The score was composed by French composer Jacques Ibert. 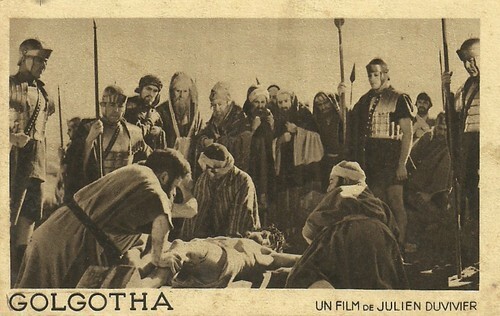 Golgotha played throughout Europe, but the British Board of Film Censors "would not allow British eyes to see it." The film opened in the US in 1937. 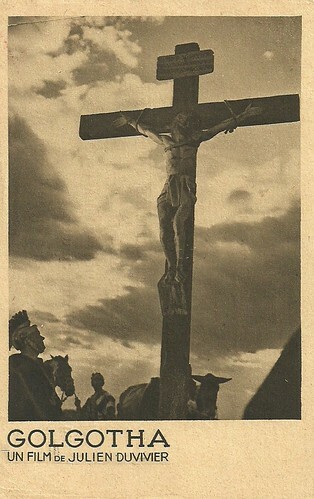 The National Board of Review named the film the sixth best foreign film of 1937.
dbdumonteil at IMDb: "the cinematography is wonderful; two examples: the three crosses, climbing up the Golgotha, or Judas's death, seen from a distance. Aerial pictures of Jerusalem already display Duvivier's sense of space which will be used to even better effects in his celebrated Pepe le Moko. The movements in the crowd compare favourably with the best of the epics of those ancient times such as Fred Niblo's Ben Hur (1925). The forty lashes scene, which the populace intently watches behind the bars, is not out of place in a Duvivier movie: nobody in France depicted human wickedness like he did." And finally Kevin C. Neece: "Golgotha is an intelligent, engaging and excellently executed film. Though Le Vigan’s Christ is perhaps too distant, too lacking in humanity and dimension, the film overall teems with sweaty, complex humanity and seems to set the tone for many Jesus films that would follow." Sources: Kevin C. Neece (Jesus Films 101), Hal Erickson (AllMovie), dbdumonteil (IMDb), Wikipedia and IMDb. 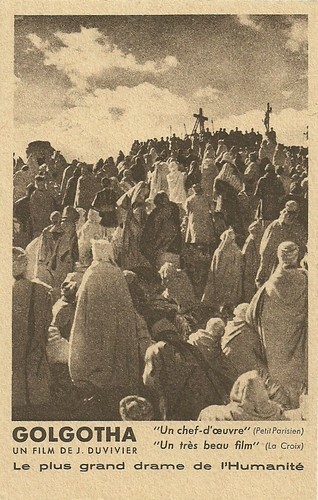 At the time (17-4-1935) the satirical newspaper le Canard Enchainé wrote: For him (Julien Duvivier), the mounting of Mount Calvary was not a tragedy. It was a tracking shot.